With just two days to go before an Oct. 17 deadline to raise the nation’s debt limit, 51% of the public views a rise in the nation’s debt limit as “absolutely essential” in order to avoid an economic crisis, while 36% think the country can go past the deadline without major problems. Public concern over breaching the debt limit deadline has risen only slightly from a week ago, when 47% said a rise in the debt limit was essential and 39% said it was not. Those who see no dire economic consequences resulting from going past Thursday’s deadline are not only skeptical about the timing – most say there is no need to raise the debt limit at all. Nearly a quarter of all Americans (23%) – including 37% of Republicans and 52% of Tea Party Republicans – believe the debt limit does not need to be raised at all. The new national survey by the Pew Research Center, conducted Oct. 9-13 among 1,504 adults, finds that 52% believe political leaders will resolve the debt limit issue before the deadline, while 44% think they will not. Democrats are more optimistic than Republicans that a solution will be found (58% vs. 47%). Despite deep frustration with national conditions, the public’s views of Washington political leaders have shown only modest changes since before the government shutdown began. Approval ratings for President Obama (43% approve), Democratic congressional leaders (31%) and GOP leaders (20%) all are at or near all-time lows, yet are not substantially more negative than they were in early September, a month before the shutdown started. Republicans continue to get more blame than the Obama administration for Washington’s fiscal policy stalemate, but the balance of opinion has not changed in the past week. 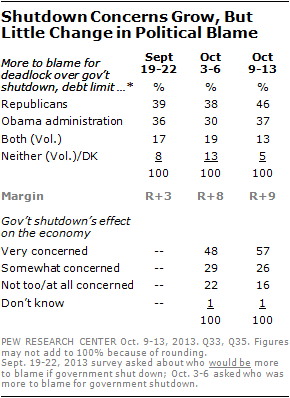 In the new survey, 46% say Republicans are more to blame for the deadlock in Washington over the government shutdown and debt limit; 37% say the Obama administration is more to blame. A week ago, when the question asked just about responsibility for the government shutdown, the public said Republicans were more to blame, by 38% to 30%. Over this period, the percentage of Americans who say they are very concerned about the economic impact of the government shutdown has risen, from 48% to 57%. As the government shutdown drags on and the debt limit deadline approaches, 81% say they are dissatisfied with the way things are going in the United States, while just 14% are satisfied. The percentage saying they are satisfied with the state of the nation has fallen 13 points since July and is now at its lowest level since the financial crisis in late 2008. The grim public mood is reflected in the record share of voters who want most members of Congress defeated in next year’s midterm elections. Nearly three-quarters (74%) of registered voters would like to see most members of Congress defeated; during the 2010 and 2006 election cycles, which both culminated in shifts in control of the House, no more than 57% in each of these two cycles wanted most members of Congress not to be reelected. Moreover, the share saying they do not want their own representative reelected – 38% – is as high as it has been in two decades. At this stage in the 2010 and 2006 midterms, fewer wanted to see their own member of Congress defeated (29% in November 2009, 25% in September 2005). An early read of voter preferences for the 2014 midterm shows that the Democrats have a six-point edge: 49% of registered voters say they would vote for or lean toward voting for the Democratic candidate in their district, while 43% support or lean toward the Republican candidate. 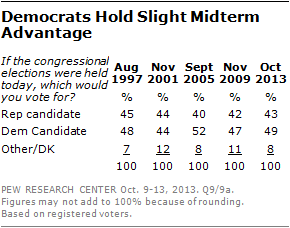 In November 2009, a year before the Republicans won a House majority, Democrats held a five-point edge (47% to 42%). In September 2005, 14 months before the Democrats won a House majority for the first time in more than a decade, Democrats held a 12- point lead (52% to 40%). The Democratic Party continues to be viewed more favorably than the Republican Party: 47% of adults have a favorable opinion of the Democratic Party while 38% view the GOP favorably. As in the past, the public by wide margins views the GOP as more extreme in its positions than the Democratic Party (55% to 34%) and less willing to work with its political opponents (32% say the Republican Party, 50% the Democrats). However, as many say the Republican Party (42%) as the Democratic Party (39%) can better manage the federal government. And by 44% to 37%, slightly more say the GOP is better able to handle the nation’s economy. Americans are divided deeply along partisan and ideological lines in opinions about the necessity to raise the debt limit. 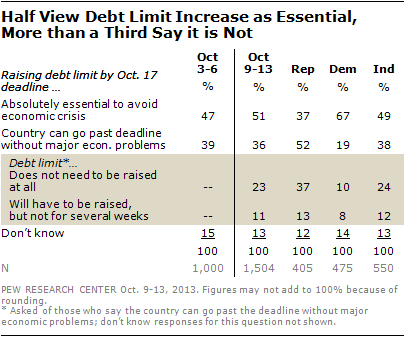 Two-thirds (67%) of Democrats say that raising the debt limit by Oct. 17 is absolutely essential to avoid an economic crisis. This includes 71% of liberal Democrats and 66% of conservative and moderate Democrats. By contrast, Republican views tilt in the opposite direction, with about half (52%) saying the country can go past this deadline without major economic problems. This includes a 56% majority of conservative Republicans, while moderate and liberal Republicans are divided. Opinions among both Republicans and Democrats have shown little change over the past week. A sizable share of conservative Republicans say it is not just a matter of when the debt limit should be increased, but whether it should be raised at all. Overall, 43% of conservative Republicans believe the U.S. can not only go past the deadline, but also say that raising the debt ceiling is not needed at all. 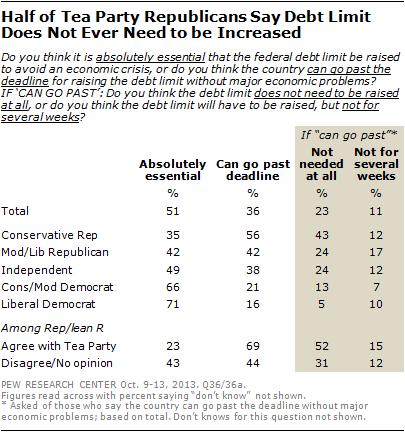 Roughly half (52%) of Republicans and Republican-leaning independents who agree with the Tea Party say it is not necessary, now or ever, to raise the debt ceiling. Will Debt Limit Issue Be Resolved Before Deadline? Overall, 52% think Obama and Republicans will resolve the debt limit issue before the deadline, while 44% do not think they will reach an agreement in time. College graduates and those in households with higher family incomes are optimistic about an agreement; about six-in-ten expect a resolution before the deadline. 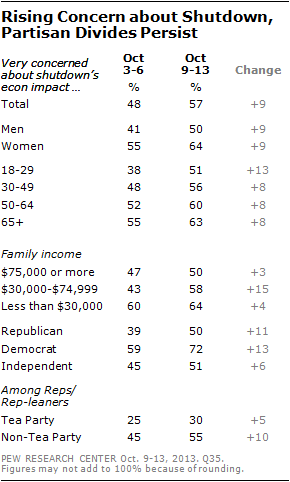 Fewer of those with lower family incomes and less education express optimism about a resolution. Young people under the age of 30 are not confident Obama and Republicans will reach an agreement before the debt limit deadline: 60% do not expect an agreement before the deadline, just 36% do. Half or more in older age groups expect a resolution. By a 58%-36% margin, most Democrats think the debt limit issue will be resolved before the deadline. Republicans are divided: 47% think the issue will be resolved in time, 49% think it will not be resolved. Moderate and liberal Republicans are much more skeptical than conservative Republicans about the prospects of a debt limit agreement before the deadline (61% and 43%, respectively, say it will not be resolved). A 57% majority of Americans say they are now very concerned about the government shutdown’s effect on the U.S. economy, up from 48% a week ago. The increase in concern crosses most demographic and political groups, though it is particularly notable among middle-income Americans. Last week, just 43% of people in households earning between $30,000 and $75,000 annually said they were very concerned about the shutdown’s economic impact. That has risen 15 points to 58% today. Nearly two-thirds (64%) of those earning less than $30,000 are very concerned about the shutdown’s impact, compared with 50% of those earning $70,000 or more. 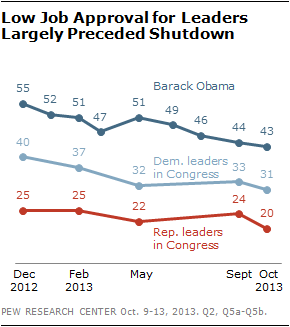 Concern about the shutdown’s effects has risen across party lines, though there remains a substantial partisan divide. Fully 72% of Democrats say they are very concerned about the economic impact of the shutdown, up from 59% last week. Among Republicans, 50% are very concerned today, up from 39% a week ago. As was the case last week, Tea Party Republicans are the least concerned segment of the public: just 30% of Republicans and Republican leaners who agree with the Tea Party say they are very concerned about the shutdown’s effect on the economy, 33% say they are somewhat concerned, and 37% say they are not too or not at all concerned. Since the start of the government shutdown, there has been little change in overall job approval ratings for political leaders in Washington, largely because public frustrations preceded these events. 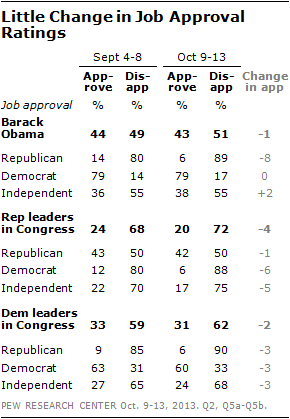 Barack Obama’s job rating is, on balance, negative – 43% approve while 51% disapprove. This marks the first time in Obama’s presidency that the share offering a negative job rating has edged above the 50% mark. But the balance of opinion is not substantially different from his job rating a month ago (44% approved, 49% disapproved) or in the wake of the 2011 debt ceiling debate (43%, 49% in August 2011). Just 20% approve of how Republican leaders in Congress are handling their jobs, while a record-high 72% disapprove. Yet, the change from a month ago, when 24% approved and 68% disapproved is modest, and current ratings are not far from where they have been for much of the past year. In Obama’s case, only Republicans rate his job performance lower today than a month ago. In fact, just 6% of Republicans approve of Obama’s job performance, the lowest rating from Republicans for his presidency (the previous low was 9% in August 2011). Just 38% of independents approve of the president’s job, while 55% disapprove. This is among the lowest ratings independents have given Obama over the course of his presidency, but is largely unchanged from a month ago. With just a 20% approval rating, Republican leaders in Congress trail not only the president but also their Democratic counterparts (31% approve). This difference is driven mainly by the relatively high levels of criticism from Republicans themselves. Just 42% of Republicans approve of how GOP leaders in Congress are doing their jobs. By comparison, among Democrats, 60% approve of Democratic congressional leaders, and 79% approve of the president’s job performance. While Republicans take more blame for the shutdown than Democrats, there is little sign that the GOP has hurt its position relative to Democrats on a range of traits and issues. Overall, 42% view the Republican Party as better able to manage the federal government, while about as many (39%) say the Democratic Party is better described this way. In December 2012, the Democratic Party held a 45%-36% advantage over the GOP as the party seen as better able to manage the government. The Democratic Party continues to be seen as more willing to work with the opposing party than Republicans (50%-32%), and far more say the GOP is more extreme in its positions than the Democratic Party (55%-34%). However, on both of these measures, the Republican Party’s standing is not significantly different than it was in December of 2012. There is a divide within the GOP when it comes to which party is more extreme in its positions. 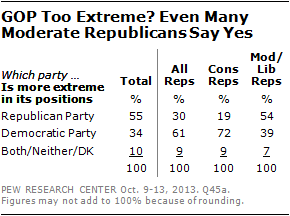 Overall, 61% of Republicans say the Democratic Party is more extreme in its positions, 30% say the GOP is more extreme. However, among moderate and liberal Republicans, 54% call their own party more extreme in its positions, just 39% say the Democratic Party takes more extreme positions. By contrast, conservative Republicans view the Democratic Party as more extreme by a 72%-19% margin. When it comes to the key issue of dealing with the economy, slightly more say the Republican Party (44%) than the Democratic Party (37%) could do the better job. 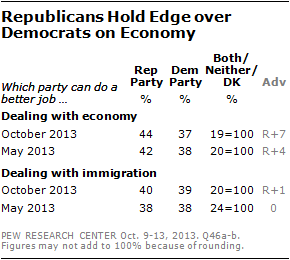 Independents favor the GOP on the economy by a 46%-30% margin. The public is divided over which party can better handle immigration: 40% say the Republican Party could do the better job dealing with immigration, 39% say the Democratic Party. 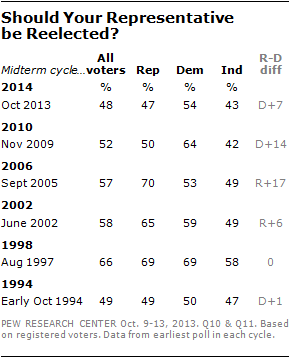 More than a year ahead of the 2014 midterm congressional elections, Democrats hold a slim edge over Republicans. Overall, 49% of registered voters say that if the elections for Congress were being held today, they would vote for the Democratic Party’s candidate in their district, 43% say they would vote for the Republican candidate. Four years ago, in November of 2009, there was roughly the same balance of opinion a year ahead of the 2010 congressional elections (47% said they planned to vote for the Democratic candidate, 42% the Republican candidate). 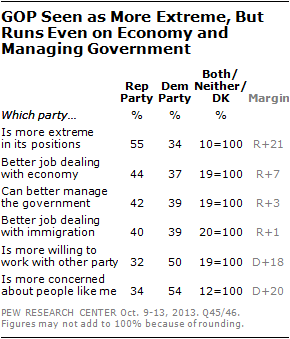 On the 2014 generic ballot, the parties run well among their traditional bases of support. There is higher support for Democratic candidates among blacks, women and younger Americans. Republicans run relatively well among white voters, older voters and those with family incomes of $75,000 a year or more. At this early stage, independent voters are evenly divided: 43% say that if the elections for Congress were being held today, they would vote for the Republican candidate in their district, 43% say they would vote for the Democratic candidate. 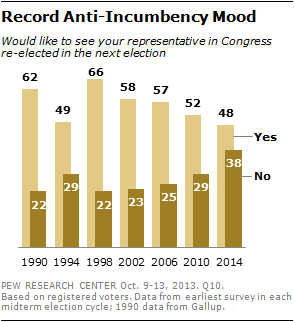 Americans express clear frustration with congressional incumbents. A record-high 74% of registered voters now say that most members of Congress should not be reelected in 2014 (just 18% say they should). By comparison, at similar points in both the 2010 and 2006 midterm cycles only about half of registered voters wanted to see most representatives replaced. Historically, voters have been more positive about reelecting their own members of Congress than members as a whole, and that remains the case today. Even so, just 48% of voters say their own member of Congress should be reelected, while 38% say he or she should be replaced. That is as negative a balance on this question as at any point in the last two decades. A year ahead of the 2010 midterm – an election in which 58 incumbents went on to lose reelection bids, the most in more than a half-century – 29% wanted their own representative to be defeated; 38% say that today. Democratic voters are slightly more likely than Republicans to say that their own representative should be reelected: 47% of Republican voters and 54% of Democratic voters favor their own representative’s reelection, as do 43% of independent voters. By contrast, in 2009, when Democrats controlled both houses of Congress as well as the presidency, fully 64% of Democratic voters wanted to see their member of Congress reelected, compared with 50% of Republican voters. In 2006, when Republicans held the Senate, the House and the White House, 70% of GOP voters wanted to see their member remain in office, while just 53% of Democrats did. In the midst of the shutdown and ongoing partisan battle over the budget and debt limit, views of the political parties are notable more for their stability than for any substantial change. In fact, overall public ratings of the political parties have moved very little over the course of the year. Currently, just 38% of Americans have a favorable view of the Republican Party while 58% have an unfavorable opinion. The percentage rating the GOP unfavorably is unchanged from July (58%) and remains among the highest on record. Favorable ratings of the GOP are up slightly from a low of 33% in July, and are roughly on par with previous surveys back to 2011. The Democratic Party continues to receive better ratings than the GOP, with about as many offering a favorable (47%) as an unfavorable (48%) opinion. Democratic Party favorability had also fallen to a low of 41% in July, and has returned to a roughly even divide that is consistent with polling over the past few years. 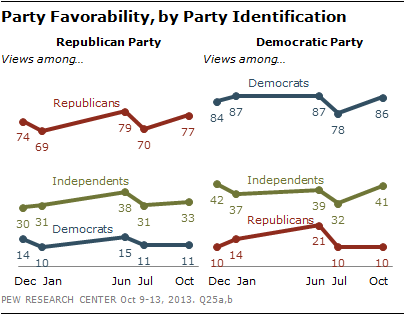 Overall views of the parties have also been relatively level across party lines. A good part of the Democratic Party’s overall favorability edge over the GOP is because it consistently receives more positive ratings from its own political base. Currently 86% of Democrats offer a favorable assessment of the Democratic Party, compared with 77% of Republicans – a gap that has been relatively consistent over the past year. But Democrats have also re-opened a favorability advantage among independents, 41% of whom now offer a favorable assessment of the Democratic Party, compared with 33% who view the GOP favorably. Polling over the summer found independents offering equally low favorability ratings to both political parties. Amid deadlock in Washington, public views of both parties’ congressional leaders are more negative than positive, while views of the president are now divided. Currently, 27% of the public holds a favorable opinion of John Boehner. While that is unchanged from January, the portion with an unfavorable view of the House speaker has increased ten points to 50% since the beginning of the year (the share offering no opinion has declined proportionately). The increase in negative views comes from Democrats (a 17-point increase) and independents (a 10-point increase); Republican views are unchanged: 46% of Republicans offer a favorable assessment of the Speaker, while 30% offer an unfavorable assessment, almost identical to the GOP ratings of Boehner in January. For Harry Reid, the story is somewhat different: he is far more well known today than in January, with more viewing him both favorably (27% up from 21% in January) and unfavorably (39% up from 34%). 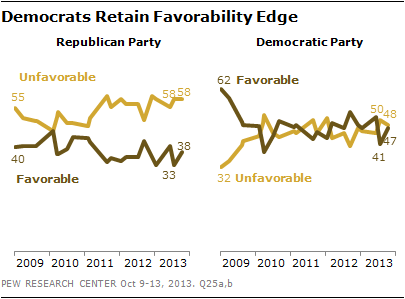 Not surprisingly, Republican views have grown increasingly negative: 58% now view Reid unfavorably up from 48%. 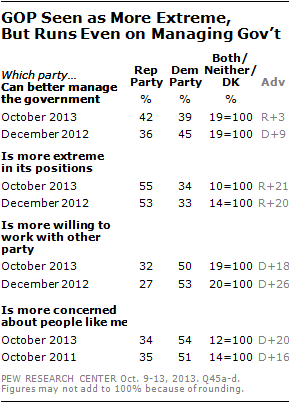 But Democratic views of Reid have improved even more steeply. In January, the Senate Majority Leader received a paltry 29% favorable, 20% unfavorable rating from his own party. 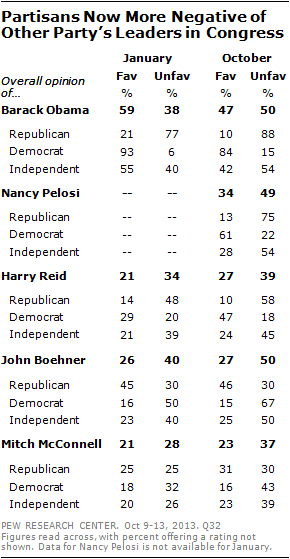 Today, 47% of Democrats view Reid favorably while just 18% view him unfavorably. Though Nancy Pelosi has played a less public role in the current budget debates, her overall visibility remains far higher than the other congressional leaders, and views of her are even more steeply polarized. Republicans view Pelosi unfavorably by a 75% to 13% margin, while Democrats view her favorably by a 61% to 22% margin. While Barack Obama continues to be viewed more favorably than either party’s congressional leaders, he receives the lowest favorability rating of his presidency today: 47% favorable, 50% unfavorable. The decline in Obama’s favorability since January – down from 59% – parallels the decline in his job approval over this period from 52% to 43%. Independents’ favorable ratings of Obama have declined from 55% favorable in January to only 42% today; 54% of independents currently have an unfavorable view of the president. Today, just 14% of Americans say they are generally satisfied with the way things are going in the country today, while about eight-in-ten (81%) say they are dissatisfied. This assessment rivals some of the most negative in Pew Research Center surveys dating back to 1990. The last time evaluations of the state of the nation were this negative was during the 2011 debt-ceiling showdown; in July 2011, before a last-minute agreement to raise the debt limit, just 17% were satisfied, while 79% were dissatisfied. 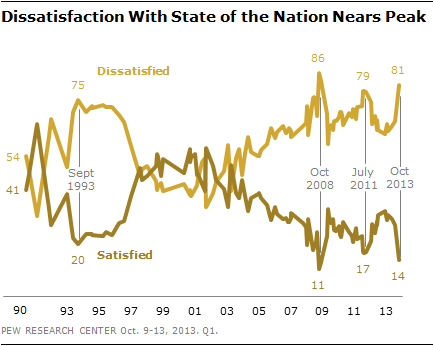 The only time in recent history when public satisfaction has dipped below current levels was in October 2008, during the depths of the financial crisis, when only 11% said they were satisfied with the state of the nation. While dissatisfaction is widespread across nearly all partisan and demographic groups, Democrats are somewhat more likely than Republicans and independents to have a positive view of national conditions: Just 8% of Republicans and 10% of independents are satisfied, compared with 23% of Democrats. After showing some signs of improvement in the summer, ratings of the national economy have once again turned more negative. Nearly half of Americans (48%) currently rate economic conditions as poor, up from 32% in September and a recent low of 29% in June. And just 13% now say the economy is in excellent or good condition, down from 19% last month and 23% in June. While current economic ratings have worsened from a month ago, there is little change in the public’s economic outlook. Americans are about as likely to say conditions a year from now will be worse (28%) as to say they will be better (25%), with another 44% saying conditions will be the same. This outlook is little changed from September, but more negative than in June, when more thought conditions would improve than worsen by a 33% to 19% margin. In general, the public is less optimistic about the future of the economy than it had been throughout much of the recession and post-recession period, when Americans were consistently more likely to say economic conditions would improve than to say they would worsen. As recently as September 2012, 43% felt the economy was on track to improve over the coming year, while just 8% thought it would worsen.